The exterior of the new ChiMei Museum. Photos by Michael Sidebotham. Thank you, Michael! 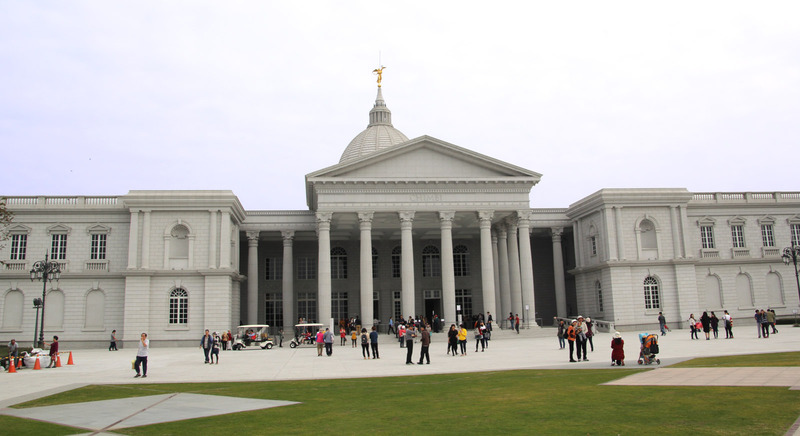 On January 1, 2015, the new ChiMei Museum (奇美博物館) opened its doors to the public in Tainan City. When I visited, the sharply-dressed staff of about 100 people were busy greeting guests, polishing brass railings and adding the final touches to the exhibits. When I entered the grand lobby, I paused to take in the splendor, which was unlike anything I had ever seen in Taiwan. The museum has a striking resemblance to the Smithsonian Museum in Washington, DC, which I have visited several times. Cultural displays of historic world cultures. The new museum proudly displays 10,000 pieces of its collection, much more than the 5,000 pieces once displayed in the old ChiMei Museum. 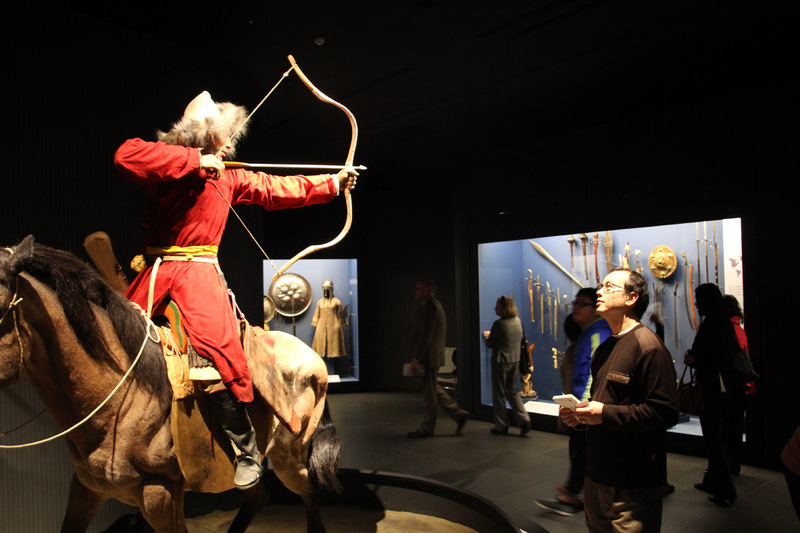 Visitors casually strolled through marbled hallways to marvel at the collection of preserved animals, classic works of Western art, cultural relics, and of course, the prized ChiMei collection of violins. The new building is, in itself, a treasure, a new iconic landmark in Taiwan, providing 40,000 square meters in exhibit space. 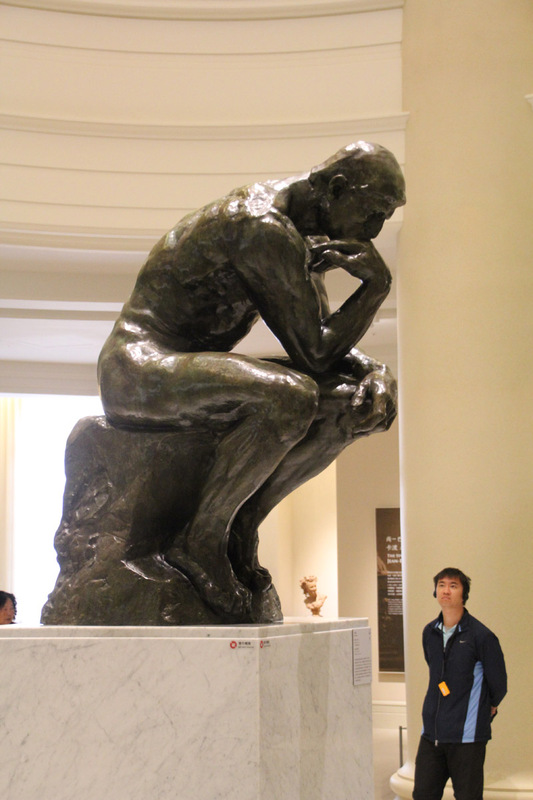 The famous Thinker statue on display in the Rodin exhibit gallery. I was surprised when I learned that the ChiMei Museum is that this grand vision began with the childhood dream of Mr. Wen-long Hsu (許文龍). When he was a small child from a very poor family in Tainan City, during the early 1940’s, he often visited a local Japanese cultural museum. The young boy visited the museum to “escape” from the hardships of wartime to let his imagination fly to Japan. It was incredible to him, that even during a war, the poorest of people could experience the culture of a faraway place. He made a promise to himself, that when he grew up, he would offer the same type of uplifting cultural experience to the people of Taiwan. Little did he know then that he would grow up to found one of the most successful companies in Asia and grow a private, world-class collection of fine art and cultural artifacts. 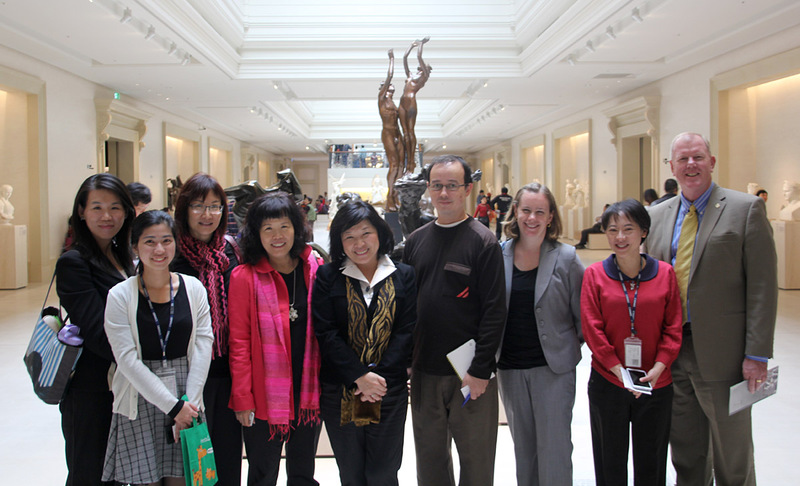 A delegation from AIT visits the ChiMei Museum. I am certain that the ChiMei Museum will attract foreign tourists and Taiwanese visitors. I don’t think that Mr. Hsu, as a young boy, could have imagined the magnitude of what he would gift to the people of Taiwan. It’s hard to believe that the project of building a suitable museum for the ChiMei collection, which began in 1988, almost failed to materialize on many occasions and for many reasons. On the first morning of 2015, the organizers, like Patricia Liao (廖婉如) could bask in their accomplishments after overcoming stressful challenges with sometimes very creative solutions. Because of their commitment, the ChiMei museum is a crown jewel of culture available to everyone who visits Tainan City, the ancient cultural capital of Taiwan. 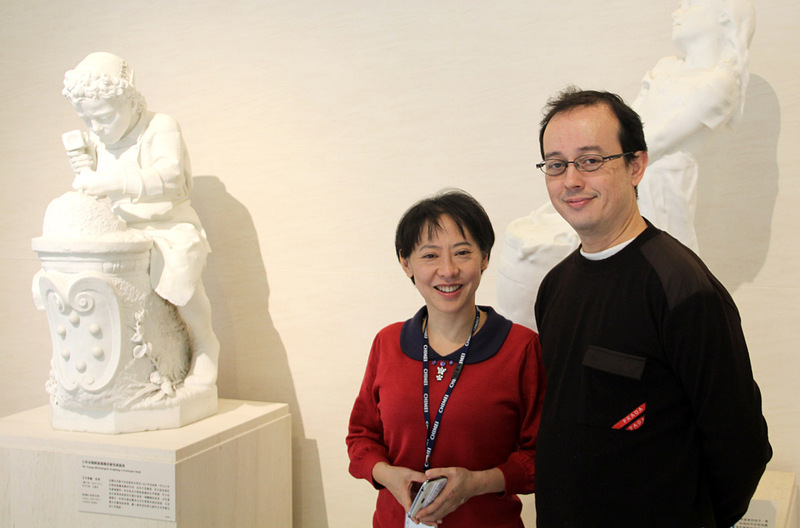 Visiting with Patricia Liao (廖婉如), Deputy Director and organizer of the new ChiMei Museum. Visitors who wish to tour the new ChiMei Museum can visit the web site (http://www.chimeimuseum.org) to place a reservation. Demand is high, so you may have to wait 3-4 weeks for an available day you can visit. Admission is free for Tainan City residents and NT200 for non-residents. The museum is open every day, except for Mondays from 9:30 am – 5:30 pm. You can also call (06) 266-0808 for information. The location is No. 66, Sec. 2, Wenhua Rd, Rende District, Tainan City 71755 (71755臺南市仁德區文華路二段66號). Voters demand change in Taiwan through its elections. Now what? As an American journalist living in Taiwan for the past 6 years, I have enjoyed the fruits of living on this diverse island, but its people have been struggling to recover economically after the global financial crisis of 2007-2008. Before that, Taiwanese people were recovering from another drain on their economy caused by the steady flight of manufacturing jobs from Taiwanese companies moving their manufacturing to China since before 2000. During that time, along with the flight of companies and skilled labor to China, Taiwan also lost access to foreign investment capital and international markets. There have been some promising signs of future recovery, however. According to a November 16, 2014 article in the South China Morning Post, Taiwanese manufacturers are beginning to move their operations back to Taiwan. Even though mainland China workers earn a minimum of US $2,472 per year, compared to a minimum of US $8,481 per year for Taiwanese workers, growing risks in the Chinese business environment and benefits of the Taiwanese marketplace are attracting more companies to return. Taiwan has added 89,000 new jobs since 2006. The signs are positive, although the recovery has been slower than expected. Expectations were set high by the promises of President Ma’s governing administration (2008-present). The ruling Koumingtang (KMT) Party touted liberalization of economic activity with China, which they promised would result in more jobs and increased prosperity for Taiwanese people. 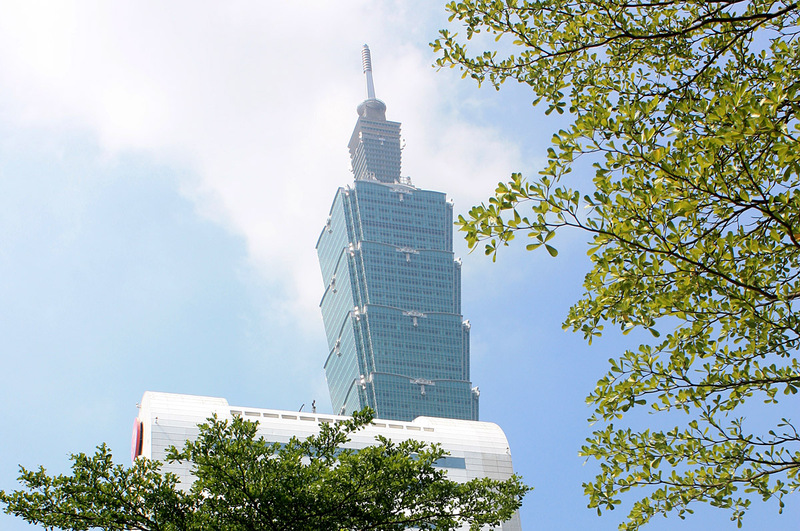 After 6 1/2 years of governance by the KMT administration, Taiwan’s economy saw some improvement, but the results fell well short of expectations, and the citizens expressed their disappointment during the local Taiwanese elections of November 29, 2014. The ruling KMT Party lost leadership positions in unprecedented fashion. Many people believed the KMT losses were a result of slow economic growth, dissatisfaction with the growing disparity between the income classes during the past six years, and they questioned the legislation and negotiation methods of the trade and service agreements with with Beijing. President Ma Ying-jeou’s cabinet, and Prime Minister Jiang Yi-huah resigned from their posts, and according to a recent article by the BBC, President Ma also resigned as Chair of the Kuomingtang Party, stating that the KMT had failed to reform Taiwan quickly enough to meet the public’s expectations. The people have spoken through their votes, and new leaders from the “Green Camp” (Democratic Progressive Party and other Independent Parties) prepare for the upcoming Presidential election in Spring 2016. It is an exciting time for the new leadership, but they have the challenging task of finding solutions to give people the change and improvements they are looking for. I know thousands of people in Taiwan, and most of them feel very insecure and uncertain about Taiwan’s future. This past year, over 100,000 recent college graduates could not find a job. I can sympathize with the many parents who invested their savings to educate their children only to find no sign of hope for employment. As a journalist and business entrepreneur residing in Taiwan while observing and learning about Taiwanese society, culture and business, I have my own ideas and thoughts about economic reform that I would like to share for the people’s consideration. Improved relations with China has been a positive development for Taiwan, as a more relaxed environment has produced more opportunities and cooperation for both sides. There is nothing to gain from political and military tension (except for the people who hold power and supply weapons systems.) What I hope to see is for economic and cultural ties to continue to improve between Taiwan and China, but most people would prefer to see the process of negotiations to be transparent and follow the proper legislative procedures, so the terms of the agreements can be as mutually beneficial as possible. Taiwan should continue to pursue dialogue and participation in other international agreements, such as the Trans Pacific Partnership (TPP), but because of the lack of transparency in the negotiations, Taiwan’s leaders should carefully analyze the terms and make its agreements in a transparent manner in order to ensure equitable benefits. Taiwan should follow the lead of New Zealand, which has been firm in negotiating for terms that are fair for the people of their country. I don’t recommend accept terms “as-is” in order to reap potential benefits before weighing what level of autonomy the Taiwanese people will need to give up to gain the benefits. The Taiwanese leadership should also examine and evaluate its current international agreements and relationships and decide what policies need to be changed to strengthen these relationships. Of course, Taiwan has signed the controversial Economic Cooperation Framework Agreement (ECFA) with China, but it has also signed the Agreement between New Zealand and the Separate Customs Territory of Taiwan, Penghu, Kinsmen and Matsu on Economic Cooperation (ANZTEC). Taiwan also signed a free trade agreement with Singapore in 2013. I believe that continued efforts with these international partners can make Taiwan a more attractive trading partner. I also believe that Taiwan’s tourism sector is widely underdeveloped for international tourists. Efforts by the Taiwanese government has been focused on Chinese tourists, and I have never really seen any substantial efforts to attract tourists from other countries. 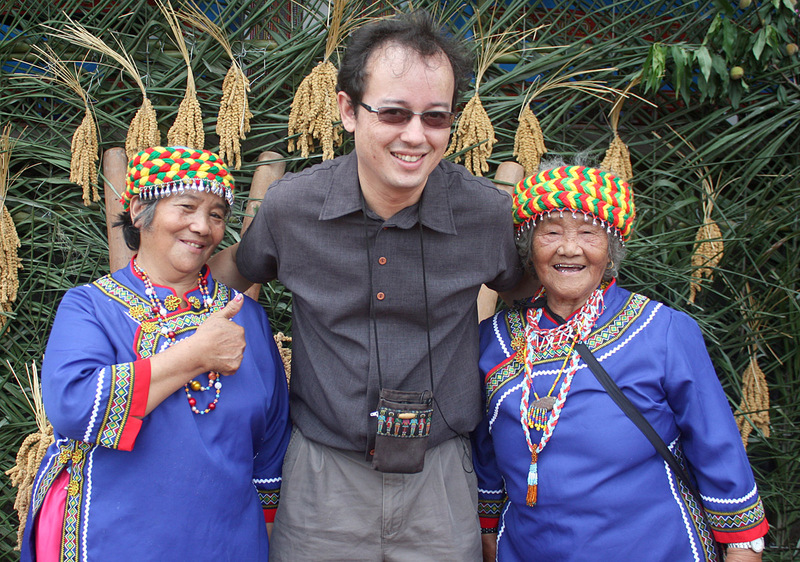 I have worked to promote cultural exchange between the indigenous (Austronesian) tribes of Taiwan and the 400 million Austronesian peoples in 30 plus countries of the Pacific and Southeast Asia, so I believe that another opportunity exists for Taiwan through its Austronesian cultural ties. The 15 recognized Austronesian tribes in Taiwan represent a minority of about 2% of the population, and their culture and language (and DNA) more closely resemble the cultures of Polynesia, New Zealand and Madagascar than the Chinese. Dr. Marie Lin has performed groundbreaking research to show this DNA link. I believe that if more Taiwanese people could take DNA tests, they would be surprised to discover how closely related they are to the world’s Austronesian population. What does this mean for Taiwan? As more Austronesian peoples are discovering their cultural and historic links to Taiwan, there is more interest in cultural and academic exchange. As awareness grows, there is also a growing opportunity for tourism from a marketplace of 400 million people. Indigenous tourism and ecotourism is already growing in Taiwan, but efforts to attract international tourists through Taiwan’s Austronesian cultural connection would accelerate that, and develop a type of tourism that has less impact on the environment. Because of the ANZTEC agreement with New Zealand and the connection with the Austronesian Maori tribe from New Zealand, Taiwan is increasing its cultural activities with New Zealand. But, is anyone prepared to leverage this activity to produce more economic cooperation between the two partners? There may be groups in Taiwan who wish to develop and promote this type of economic development, but in my opinion, they need more recognition and support to create lasting results. Lastly, I believe the people of Taiwan have a real opportunity in their hands. Being a player in a global economy can bring prosperity, but without self-sufficiency and authoritative self-regulation, Taiwan loses much of its leverage, and puts itself in a weak and vulnerable position with other nations. We can look at the multiple food scandals in Taiwan over the years and see how reliance on food products from Vietnam, China and other countries has put the health of the Taiwanese people in jeopardy. We can also see how lax regulatory oversight and light punishment has led to food industry executives to pursue profits over stricter standards to protect their customers. As the future leaders of Taiwan start looking for solutions for the future of Taiwan, they should take the time for self-reflection. If they can enact policies that improve the lives of the Taiwanese people, and the environment, other opportunities will fall into place. Take care of the Taiwanese people, and they will happier, healthier, and more productive. In other words, make Taiwan a more attractive place in the world to live and to do business, and the opportunities will naturally come. 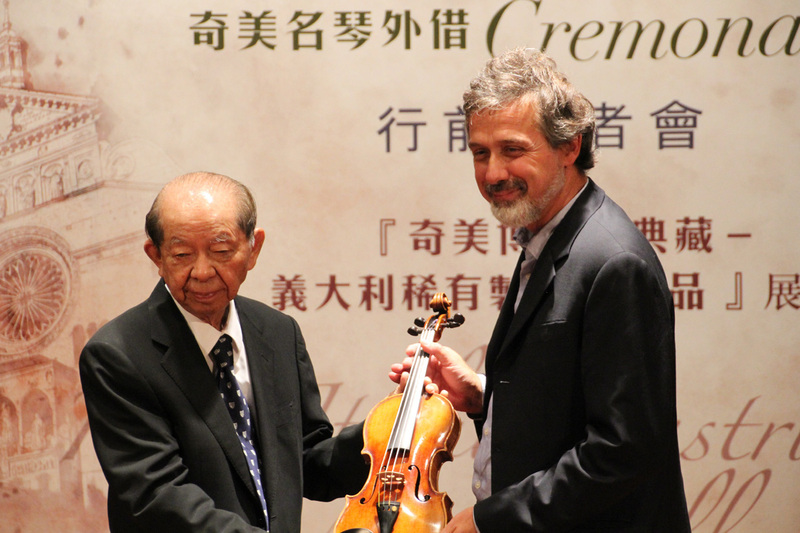 Wen-Long Hsu presents a violin to Carlo Chiesa. On September 18, during a ceremony at the Chi Mei Museum in Tainan City, Taiwan, a collection of violins were displayed to the media and given a suitable sendoff by their caretakers before embarking on their journey to the Cremona Violin Museum in northern Italy. The heads of the Chi Mei Museum and the Chi Mei Culture Foundation attended the event. A string quartet performed on the antique instruments to set the mood for the occasion before a few notable speakers explained the significance of the collection’s return to their birthplace in Italy. The speeches stirred the audience, but the stars of the ceremony were the twenty-two priceless violins on display, which were famous Italian pieces produced in Cremona from the 1600’s and 1700’s. 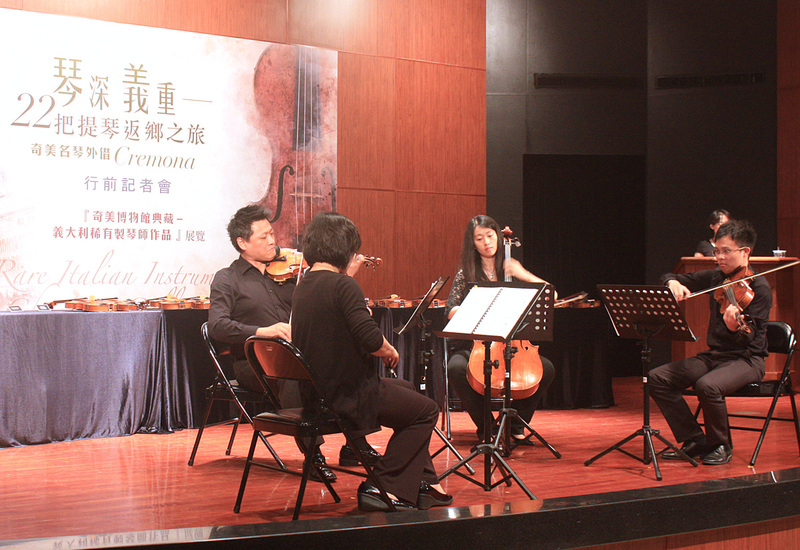 A string quartet performed classical music on priceless violins from the Chi Mei Museum collection. 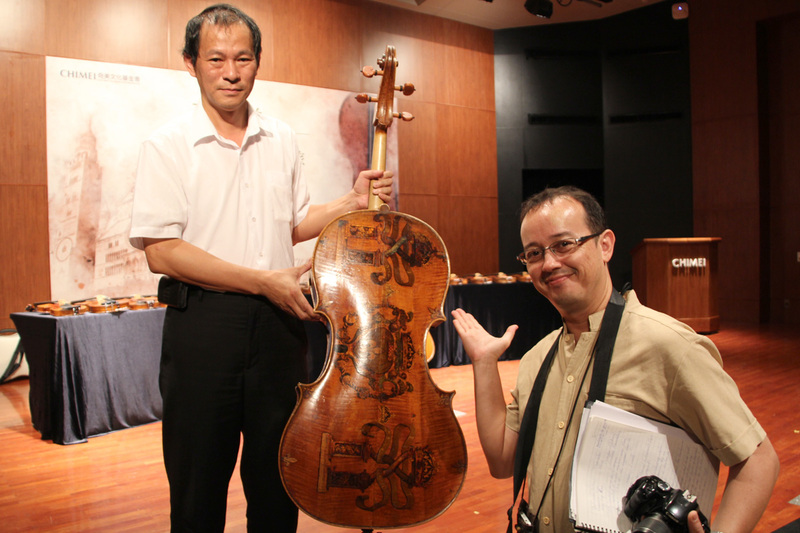 Wen-Long Hsu (許文龍), founder of the Chi Mei Museum recollected his childhood dream and reasons for collecting 1,350 valuable violins, violas and cellos, which date from 1566 to the 1700’s. After starting his collection in 1990, he has accumulated many of the best violins in the world. Mr. Hsu regularly shares his collection with violinists who dream of performing on them. As part of his ongoing commitment to share the culture with society, he has shared part of his collection with the Cremona Violin Museum for special exhibitions since 2005. Carlo Chiesa, Curator of the Special Exhibition at the Cremona Violin Museum presented the historical significance of Cremona, Italy, home to the most famous violinmakers in the world. He explained that almost all of the musical instruments produced in Cremona have found their way to private collectors and museums all over the world, so the museum holds special exhibitions to bring the violins home to Cremona on a temporary basis. The Chi Mei Museum has provided part of its collection to Cremona Violin Museum since 2005, but this will be the first time that Chi Mei is the sole provider of violins for the special Italian exhibition. 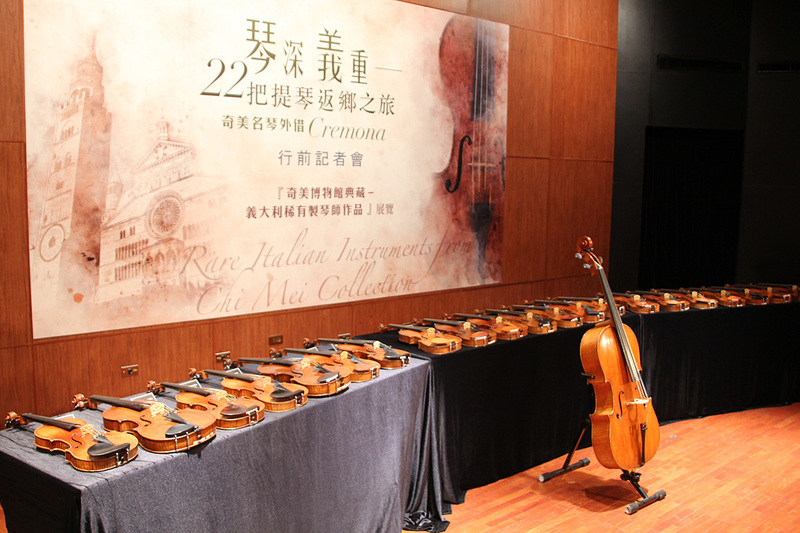 This occasion will also be the largest loan of violins ever made by Chi Mei Museum to another museum. The collection of antique violins that will travel to Cremona, Italy. Traveling to Cremona, Italy with Carlo Chiesi and the collection will be a group of Chi Mei Museum directors and a camera team that will document the exhibition for a book and a short film. The special exhibition at the Cremona Violin Museum will open on September 21, 2013 and close on October 13, 2013.